Every opportunity to play is an opportunity to learn for children. Even simple balance games are essential to their development; without an effective transition from basic balance and sensory integration their learning and reading development can be delayed. Balance is the ability to maintain control of a particular body position while doing something, with minimal postural sway. This could be something as basic as sitting at a table, jumping on one leg, playing hopscotch or riding a bike. On a daily basis, we need to be able to do a whole lot of things, preferably without falling over, and this is where good static balance (balancing on one leg, or playing “musical statues”) and dynamic balancing (riding a bike or playing hopscotch) is essential. What is seemingly a very simple skill has a direct impact on our children’s ability to participate in and enjoy physical activity, which in turn affects their development intellectually, physically and even on an emotional level. I’ve put together a list of balance games and activities, that children can enjoy on their own, in a group and in the case of a balance bike, in a gang. The perfect excuse to monkey around, the Active Play Monkey Balance Board helps kids of all ages improve their balance and coordination. The board, decorated with the cutest purple monkey graphic, is designed to encourage physical activity by developing and improving balance, leg strength and coordination. It’s easy to use and it can support up to 200 pounds, which means the entire family gets to have a go. I love everything about the YOGI Yoga Cards Kit, from the beautiful illustrations and sweet rhyming instructions to the way in which they introduce yoga to children, and adults too. There are 40 cards: 20 with yoga poses and the other 20 with fun, rhyming descriptions about the pose. The kit includes 4 games, 2 YOGI dice and a birthday activity. This clever little card kit does so much more than just encourage balance; it encourages little ones’ imagination and improves self-confidence, mental and physical balance. Hop hop hooray! An updated version of the classic pogo stick, the Grow-To-Pro lets children as young as five get pogoing like a pro. The extra-base helps with balance and once they’re ready, you can remove it, “easy-peasy-lemon-squeezy” as my four-year-old would say. The sure-grip handles are the perfect size for smaller hands and the skid-resistant foot pedal means more grip, less slip. It has an internal spring mechanism that allows kids to bounce from 3–5 inches and has a weight capacity up to 60 pounds. Who would have thought one of the oldest balance games could still provide so much fun and develop essential balancing skills. 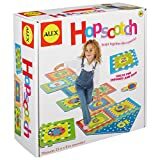 ALEX Toys Active Play Hopscotch is a 23-inch wide and 81-inch long foam board that can be used indoors and outside, for endless hours of hopscotch fun. It includes 10 number tiles and 4 place markers. The set is put together like a jigsaw puzzle and stores easily in its own little carry bag. Another of the ‘vintage’ balance games with a modern twist. The sweet little egg and spoon relay game is perfect for parties, rainy days indoors and playschools. You’ve got to get across the finish line without dropping your egg, otherwise, it will ‘crack’. Included are four easy-grip spoons, four egg-shaped beanbag ‘yolks’ and four ‘re-breakable eggshells. It’s good for 2 to 4 players. The Wishbone 3 in 1 bike is so much more than just a bike. The design is so lightweight and stable it helps teach your little one to walk, and with no pedals, toddlers learn to ride quicker than on traditional bikes. It starts off as a walker and three-wheeler, converts into a 2-wheel balance bike and when they’re old enough, it flips over and you’ve got a bigger balance bike for older kids. It’s one of the smallest and biggest balance bikes on the market. Thw 3 in 1 bike is made from sustainable wood, air-filled tyres, recycled packaging and an organic drawstring tool bag. Who’s a sturdy birdy then? 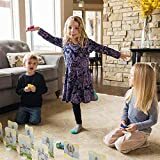 It’s one of the easiest balance games to play but challenges children on a physical level, as well as helps develop counting skills, self-esteem and social interaction. With no reading required it’s suitable for all ages. Just roll the dice, strike a pose and balance. The EzyRoller is like no other ride. It’s not a bike, or a scooter and it’s definitely not a luge—but it combines a little bit of each. With no pedals or chains, it moves using easy right-left leg movements. Perfect for smooth and even surfaces, it can be used indoors or outside. Another classic toy, apparently as old as me (according to my kids), the Sit ‘n Spin toy is exactly how you remember it. It whirls, twirls and spins, all the while encouraging balance and coordination. It’s safe for little ones and provides endless hours of fun. Have you found any games that help your child with balance? Share with us in the comments! Feature image courtesy of Flickr, Dean McCoy Photography.